Laura is so stinkin' creative. She made these for me too! I saw them online & emailed her to see if she could make them for me! She said she would try & then i got a sample one in the mail! And then i got a whole set! Yipee! 2011 is pretty awesome so far. I really hope that these first few weeks is a glimpse of how the entire year is going to go, because if that's true, then it's gonna be a fantastic year! I love when a year starts off RIGHT. Ya know? It feels good. I feel like it's started on the right foot & it has felt like a push in the right direction. I kind of feel like God is rooting for me right now. And i know he is ALWAYS for us, but sometimes you can just feel it & that is nice. Laughed with my husband - a lot! I mean, how awesome is that! This is what i mean by starting the year off right! I added another new year's resolution today - be on time for work. If i could start being on time & maybe stop biting my fingernails, life could be perfect! Haha! None of this is to brag, or to say that I am perfect, for i am certainly not! i have defintely made some mistakes this year already...but i am just thanking God for his goodness so far this year! I am on a great track with becoming healthier, too, and i want to keep it up ALL YEAR! I want to continue to read God's word everyday & to draw closer to Him. I want to be a better friend to everyone. I want to be a kind person and have patience, even at work. ;) I want to pray more again...like i used to. I am just so excited & can't wait to see all that God has planned for 2011! I hope you are having a good year as well! Keep it up...and the new look on the blog is SUPER cute! I love your new header! It is so awesome! You have lots of great things going on! This year is going to be great! I love the new design. Those coasters are amazing too! I love original things like that. Oh wow!! I love those coasters!! Is she selling them too?? Glad your year has started out so well! Mine? Not so much haha. Your blog looks great!!! 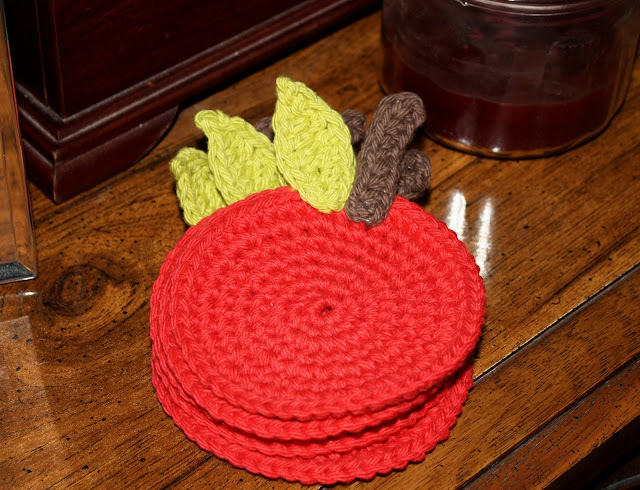 I love the apple coasters....but of course I love apples,I have some in my kitchen:)I'm so glad your year is starting off good:) Mine is too!!!! LOVE your header!!!! The whole page looks awesome!!!! I'm so happy that you are already having a great year and we aren't even 2 weeks in! What great motivation! I'm excited for you!! !